The Five Ghosts is the newest release from Bro­ken Social Scene sub­set, Stars. The album, per­haps best described as indie-elec­tron­ic, main­tains a very sim­ple sound, punc­tu­at­ed by moments of crys­tal­liza­tion. This style is, in the end, both its great­est strength and its great­est weak­ness, as the lev­el of sim­plic­i­ty does, at times, total­ly over­whelm oth­er pos­i­tive aspects of the album. Stars front­man Torquil Camp­bell shares vocal duties on The Five Ghosts with band­mate Amy Mil­lan, each pro­vid­ing their own approach to the album. Camp­bell has per­fect­ed the light, some­what breathy tone in which he sings each resound­ing line, com­ple­ment­ed by Millan’s ele­gant voice. The duets the two per­form on tracks such as the album’s open­er, “Dead Hearts,” joy­ful­ly draw the wide breadth of the music, cre­at­ing an expanse of simul­ta­ne­ous­ly rich and unclut­tered sound. Accom­pa­ny­ing Camp­bell and Mil­lan on The Five Ghosts are a wealth of sounds, pri­mar­i­ly syn­the­sized. Every­thing blend­ing togeth­er well is an under­state­ment, and the music gen­er­al­ly accom­pa­nies the sto­ries of The Five Ghosts. Yet even still, it’s hard to shake the feel­ing that not much is going on. The band clear­ly knows what its doing, as there are numer­ous points in the album that entire­ly cap­ture your atten­tion, but there just isn’t that much unique con­tent, and even the best of it isn’t tru­ly excel­lent. The lyrics of The Five Ghosts are well-matched to the soar­ing sound of the album, evok­ing the same ethe­re­al tones. Whether Camp­bell is telling the sto­ry of “The Last Song Ever Writ­ten,” singing “There was a strange good­bye out­side the sta­tion / There was a let­ter three weeks lat­er in the mail,” or Mil­lan is singing the images behind “The Pas­sen­ger:” “Here comes anoth­er strange town / Here comes anoth­er break­down / And you can run for­ev­er / They’ll catch you now or nev­er,” the words of The Five Ghosts cre­ate a unique­ly col­or­ful musi­cal world. While the line “We’re going to sing a song with­out words / And a tune you haven’t heard in a long time” prob­a­bly isn’t strict­ly accu­rate, it does an excel­lent job of describ­ing the feel­ing evoked by Stars’ music. The Five Ghosts’s biggest fault is that Stars fre­quent­ly holds onto sec­tions of tracks for far too long. As impor­tant as some lines are to a track, it’s hard to jus­ti­fy repeat­ing them four or more times in a row. The prob­lem also plagues non-lyri­cal ele­ments, the best exam­ple being “He Dreams He’s Awake.” The track slow­ly builds through Stars’ entire dynam­ic range, but takes so long to cli­max that the final, ful­ly devel­oped sec­onds of the track sim­ply aren’t enough to war­rant the pre­vi­ous few min­utes. The Five Ghosts may not be per­fect, but it is still a skill­ful demon­stra­tion of the band’s cre­ativ­i­ty and style. 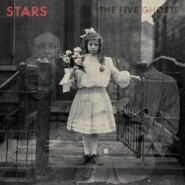 Between sim­ple but com­pelling melodies and well-sung and inter­est­ing lyrics, The Five Ghosts comes togeth­er well. The Five Ghosts suf­fers, how­ev­er, from a musi­cal over-sim­plic­i­ty that pre­vents it from being as inter­est­ing as it could be. At its best, the album is gen­uine­ly intrigu­ing - but in weak­er moments, it tends to fade into the scenery.